The Lian-Li PC-V800 is the clear choice for a Home Theater PC utilizing a full size ATX motherboard. The roomy, free-flowing design is perfect for the rigorous heat producing usage HTPCs regularly receive. 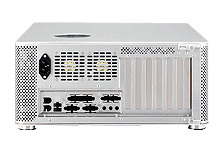 A solid built aluminum chassis acts as a giant heatsink, reducing total system heat. The PC-V800 is a fully featured ATX case that can fit all the goodies a standard sized ATX tower can fit. Five drive bays, seven expansion slots, and five front I/O ports are features most other Home Theater PCs can not boast. One glance at the PC-V800 from Lian-Li and you will see why it is the premier Home Theater Case! Material: Aluminum Dimensions: 17.3" x 12.6" x 6.3"